While on my annual Bahamas cruise, I had access to a Garmin radar/chartplotter installation on a buddy's boat. I have managed to prototype an OpenCPN PlugIn which will allow radar overlay capabilities. This is a traditional reverse engineering effort, with no support provided, expected, nor required from Garmin. - Works with modern Garmin (Ethernet capable) radar scanners only, so far. - Requires some small "adjustments" to external radar/chartplotter ethernet cabling. - Optionally requires some source of ownship heading information. Could use NMEA COG, with understanding that this will not work for stationary ownship, nor account for leeway. Range and gain adjustments understood and implemented. OpenCPN chart overlay architecture confirmed OK. I have suspended development, as I do not presently have access to a Garmin radar system. My ownship "Dyad" has old faithful Furuno analog equipment. 1. Is this PlugIn of interest to a reasonable population of OCPN users? 2. Does anyone know of a low cost (i.e. donatable) Garmin GMR 18 (HD) radar scanner that might be used to finish and publish this PlugIn? 3. Would a group of potential users be willing to make a donation in order to buy a radar scanner for same? 4. I see no obvious reason that the same approach could be taken with Furuno ethernet radar scanners. Any interest there? I am very interested in your radar project. I would kick in $100. Awesome! Show us a couple of screenshots too! I would like to see this expanded to other radars. I currently have a Raymarine RD424 + E80 and I can use the Raytech program on the PC (ethernet connection to the E80) to see radar over chart. I can help with packet sniffing / wiresharking. Myself and my company would be very interested in this and could potentially donate a Furuno or Garmin unit. Currently, we overlay radar data using expensive and crude radar servers or PCI cards to digitize the data. We need a better option than this that is cheaper and more flexible. I would love to be able to talk directly to the Ethernet port on those radars. See my earlier post. How long did it take you/how difficult was it to get the functionality you have now? Roughly where are you located? Perhaps we could work together to make a plugin for OpenCPN that my company could then adapt for use in our software...? I'm interested. Set up a button for Paypal and I'll send money. Have you already recorded all the transactions between the MFD and the Radome ? $10 from 100 people should be easily do-able. All the pieces for an open MFD are starting to fall into place; Low power pc, low power sunlight display, and now the RADAR ! I have captured and decoded the TCP/IP streams from a Garmin GMR18 HD scanner, while connected to a Garmin chart plotter. This was done using a buddies permanently installed system. I understand enough of the streams to produce OCPN overlay images, control the scanner range and gain settings, power up/down, etc. All this is done. What I need is the scanner itself, installed on my boat, in order to to clean up and produce a release-quality OCPN PlugIn, and to support the PlugIn after release. I would like to pledge some $$ to this sub-project. Before doing so, I would like some kind of a tracker for this radar project. 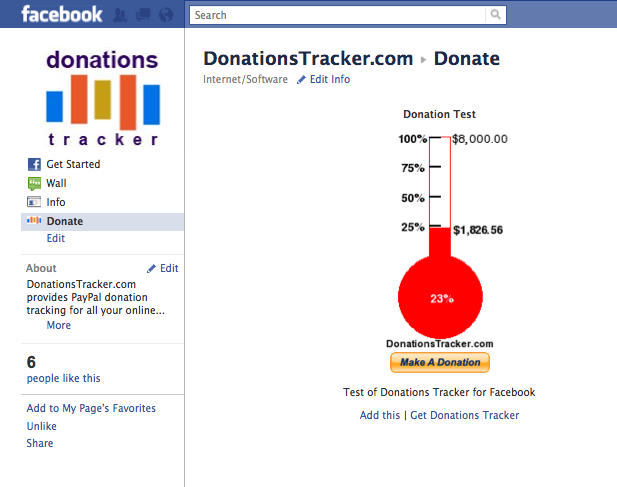 I would guess there are some decent,free web-donation-trackers. I don't know what you mean by a tracker for this project. I mean a donation tracker, for just the radar overlay, to buy you the Garmin Radar. OK, thanks for the info. Seems like a great idea for this specific Garmin Radar Overlay project. No need to interface with f***book at all. We will have a link on opencpn.org home page. Its relatively cheap, $9.00/mo. It will take us a couple of days to get this organized. Please stand by. OK, we have a donation tracker to allow us all to follow the contributions to the OpenCPN Radar Overlay Project. Funds donated thru this tracker will be earmarked exclusively for the Radar Project. The existing OpenCPN general donation mechanism, accessible from sourceforge or OpenCPN itself, remains intact. The Tracker, and direct Paypal access link, are now on the opencpn.org home page, thanks to our net guru Will. We have placed a target for contributions of $1,100 US, which will allow the purchase of a Garmin HD scanner, our first target platform. So, step right up and make your mark. Nice to be first who have made donation for such nice new feature for OpenCPN. Do you think Simrad/Lowrance Broadband Radar BR24 could be better solution for small boats (less power consumption, better accuracy)? Great, hope many are interested in this! I am also curious about how much change is needed for different brands of scanners. Dave, have you compared your notes from the Garmin scanner to the student project report notes reffered to in this forum earlier ? Does the wheel need to be reinvented for each new scanner, or can the plug-in be modularized from the start to consider other brands? At 15.00 UTC the tracker shows a coverage of 26%. Folks, take your time and contribute your grain of salt!